MFF Whey Protein 90 Isolate™ is best whey protein isolate in India made up pure whey protein Isolate which is one of the Premium Whey Protein available in the market today. It’s a pure fresh milk protein which have been quality tested to bring more amount of protein in every serving. 1. What is Whey Protein Isolate 90%? Whey Protein Isolate is very high-quality protein which contains 90% protein from milk source. Whey is separated from liquid milk (which is 80% whey and 20% casein) during the process of making cheese by adding enzymes in the liquid milk. Separated Whey which is in liquid form is then further processed to become in the powder form knowing to be as Whey Protein Concentrate. 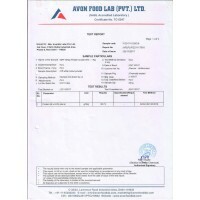 Whey Protein concentrate is further purified and filtered to become whey protein Isolate. Whey protein isolate during filtration process is processed in such a way that maximum amount of fat, carbohydrate gets removed leaving the high quality protein. This is not only easy to digest but gets absorbed faster than whey protein concentrate. Not only MyFitFuel Protein mixes very well but is also very delicious in taste. --> 29.5 gm of protein on “Dry Basis” in every 32.8gm serving. --> 27.9 gm of protein on “As In Basis” in every 32.8gm serving. --> 26.3 gm of protein on “Dry Basis” in every 32.8gm serving. 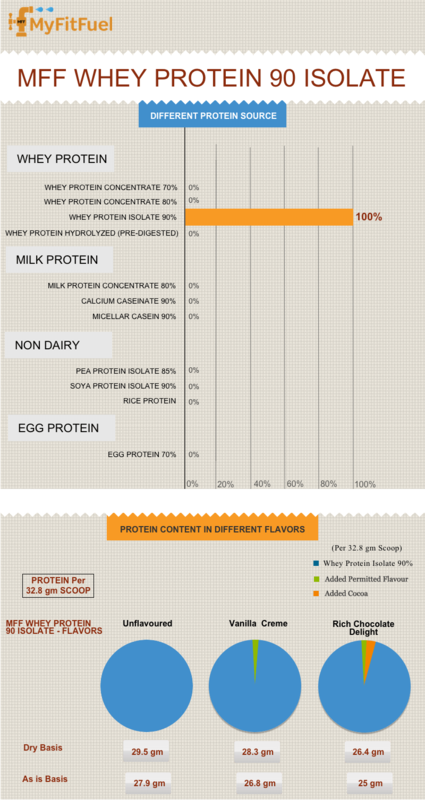 --> 25 gm of protein on “As In Basis” in every 32.8gm serving. 2. Why is it MyFitFuel Isolate best whey protein isolate in India and how it will benefit your training? --> One of the Best Milk Protein source to repair and increase muscle mass. --> Provides more amount of protein in every scoop. --> Highly low amount of calories, carbohydrate, fat and is suitable for every individual who is looking to take very high-quality source of protein but almost negligible carbohydrate and fat. 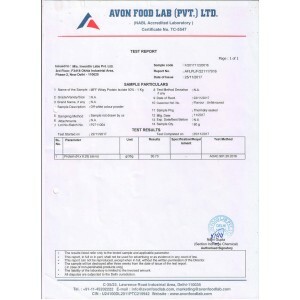 --> With very high biological value (BV) this protein provides the high amount of naturally occurring amino acids. Example MFF Whey Protein Isolate Unflavored variant provides almost 6.3gm of BCAA, 4.5 gm Glutamine and 13.6 gm EAA’s (Essential amino acids). 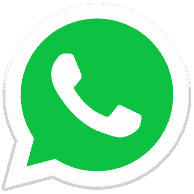 --> Very quick to digest and fast to absorb. This helps your body to recover quickly and build muscles more effectively. --> The best source of protein for the Lactose Intolerance as it almost contains the negligible amount of lactose. 3. Does timing matters? Is there any best time to take MFF Whey Protein Isolate? MFF Whey Protein 90 Isolate use depends totally on your goal and timing of your workout. So as to get maximum benefits, it’s important to calculate the right amount of daily required protein as per your goal and divide the total requirement with different timings of intake throughout the day. MFF whey protein Isolate is the best choice for pre and post workout and for the first thing in the morning. Whey Protein Isolate due to very fast digestion and absorption if taken within 20-45 minutes after workout helps to increase nutrient delivery and glycogen replenishment. It helps to increase muscle mass and not only helps to you to get stronger but also helps to increase the metabolism of the body which indirectly helps to reduce the extra unnecessary fat in the body i.e overall weight loss. 4. What is the difference between Protein calculations on “Dry Basis” vs “As in basis”? As educating customer is our priority. Like we were the first one to bring 100% Transparency in Indian Sports & Fitness Nutrition market and in the same way we are the first to bring better education for our customer when it comes to the difference between Protein calculation on “Dry basis” vs “As in Basis”. 5. What makes MyFitFuel Best Whey Protein Isolate Brand in India? Consistency - Consistency in the quality is very important for us. We take every measure from beginning to end to provide you the same nutrition quality. MFF Whey Protein isolate ingredients are consistently tested to give you the same wonderful results every time. Transparency- We believe it’s your right to learn about the products actual benefits and its worth before you buy whey protein Isolate online in India. Many companies never disclose the right percentage of protein used, helping them to hide the actual worth and benefits of the product. We provide complete information in our “Protein Insight” by telling you which protein we use before you buy whey protein isolate from us. 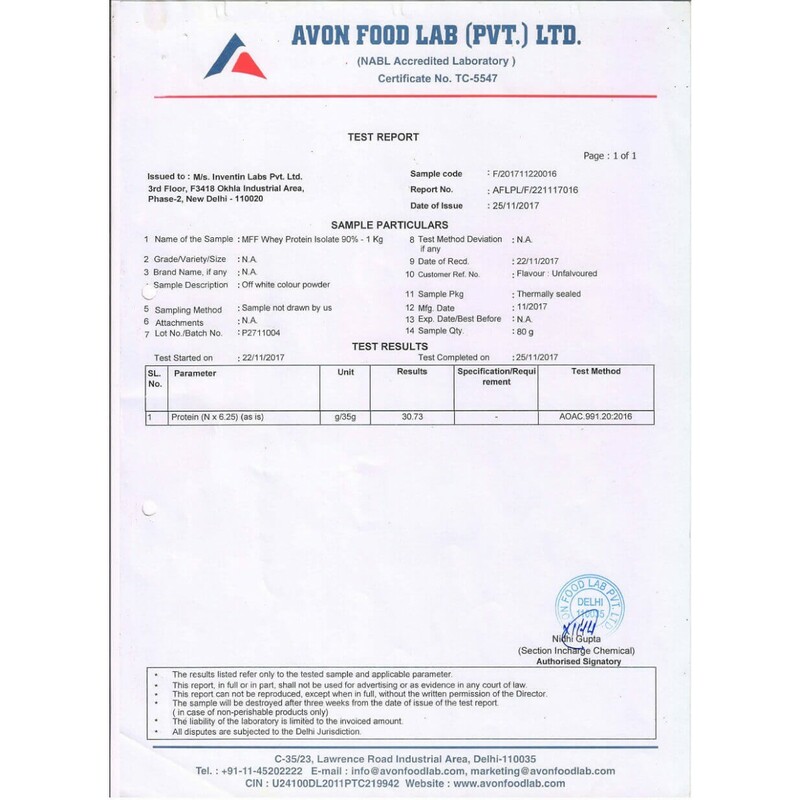 Our transparency also helps you to always know that the whey protein isolate price you are paying us, is it the right and the best whey protein isolate price in India. Pour 200-250ml of water in good blender like MFF™ Blender and add 1 scoop of MFF Whey Protein 90 Isolate™. Shake it for 15-20 seconds and consume immediately. Use less liquid for stronger and thicker tasting taste. We recommend 2-5 servings daily to complete your protein intake. To promote lean muscles, expert suggest 1g of protein per pound body weight everyday (2.2g per kg of body weight everyday) consumed during a different time of the day. Some train in morning and some in evening but we recommend following important serving times of MFF whey protein 90 Isolate. A benefit of taking with Water: - Taking MFF Whey Protein 90 Isolate™ with water helps you to get better Lean Muscles and reduces the overall calorie intake from your protein shake. Protein shake in water is also recommended to any individual following the weight loss program with restricted calories intake. Benefits of taking with toned or double toned milk:- Adding milk with protein helps to make the shake creamier and thicker. But 250 ml of toned milk will also add almost 150 extra calories in every shake. So, if you are looking to bulk up or to increase weight then taking the protein shake with milk will always be recommended. 1. What does MFF Whey Protein 90 Isolate™ actually do? Every scoop of MFF whey protein Isolate contains 90% protein quantity by volume which helps different athletes, individual in different fitness activities including bodybuilders and other sports players to repair and grow their broken muscles tissues. MFF Whey Protein 90 isolate helps our muscles to recover better specially during post workout period. 2. When Should I take MFF Whey Protein 90 Isolate™? It all depends on the lifestyle and the goals of an individual. Some train in morning and some in evening but we recommend following important serving times. --> Immediately after your workout. Protein plays very important role for repair and re-growth of your muscles. If we put this in very simple words, to increase the muscle mass strength athletes needs protein and to stop over training endurance athletes need protein for muscular repair. Ultimately all every individual including athletes and bodybuilders need protein to help them cope with the demands of heavy training and growing competition. 4. Is MFF Whey Protein 90 Isolate™ suitable for vegetarians? Whey protein Isolate is made from pure milk and it is considered as a vegetarian source of protein. 6. Can I take MFF Whey Protein 90 Isolate™ with any other supplement? 7. 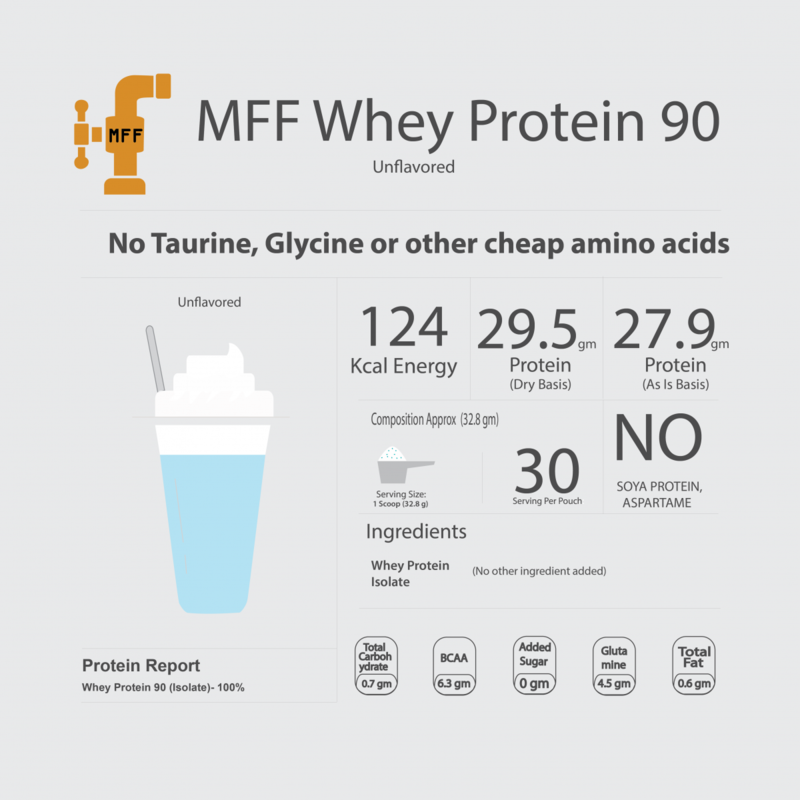 How do I make perfect whey protein shake with MFF Whey Protein 90 Isolate™ ? It is very easy to make a perfect shake from this protein. There are only few simple steps which you always need to keep in mind for the perfect shake. First you need a good blender like MFF™ Blender, pour approx. 200-250ml of liquid in the blender. Putting milk will help to bring creamier shake but water will help you to avoid intake of extra fat that comes from milk. Next, pour one scoop of protein into the liquid and shake it for 15-20 seconds. Easy isn’t it… Just follow these basic principles and a perfect tasting shake will be ready for you. 8. What effects should I expect from taking MFF Whey protein 90 Isolate during my training routine? Our protein is made from very high quality source ingredients and also provides a very high level of protein on every scoop you consume. Results vary on every individual depending on individual body type, diet, nutrition and training. For an athlete or bodybuilder, it can help to reduce the muscle breakdown, improve recovery time and repair broken muscles tissues faster after post workout. 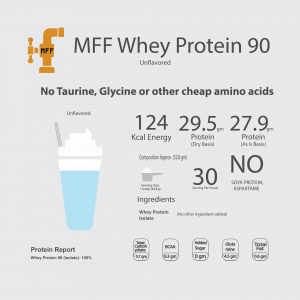 9. Who should take benefits from taking MFF Whey Protein 90 Isolate™ ? 10. How much MFF Whey Protein 90 Isolate™ should I take? Daily requirements of protein totally depend on the sports activity you are in and that determines your personal needs. But on an average basis it is recommended to consume 2-5 servings per day. You can also read our complete Protein Research into “Protein University” Section of “knowledge Hut”. 11. What are the side effects of taking Whey Protein Isolate™? I have used this product without a shaker. Mixes fine in a glass using a spoon, although a very very little bit of lumps can be seen floating which is not a problem. The unflavored one i ordered tastes just fine when mixed with milk. Overall seems to be pretty good product. Will wait and see the product effectiveness on muscle improvement. Good effect after 1 to 2 week shown on my body and my sister body.sista has 6kg weight loss on unflavored prodect.